Laura Hazard Owen says that a real book banning is more than a 4-Hour affair. So is Barnes & Noble banning The Four-Hour Chef because of its controversial content? Not so much. Ferriss’ book is simply one of several that Barnes & Noble will not stock in its stores because it is published by Amazon. I view things through a different lens. I think the implications of this boycott or ban — choose the word you prefer — are larger than people realize. What we’re looking at is an interesting question. Yes, this corporate combat is playing out on the scarred battlefield of the digital dynamic: Barnes and Noble, like most booksellers, is struggling for its footing as Amazon’s digital supremacy and customer-service battering ram punch bigger and bigger holes in the fortress walls of old publishing. But even if we all stood atop a clover-covered hill of peace at the moment, gazing down on a more cordial, pastoral colloquy between Owen and Ferriss, the issue would resonate with worthwhile urgency in our business-dominated era. If a bookstore refuses to sell on the grounds of a business dispute, as is the case here, is a “ban” in place? 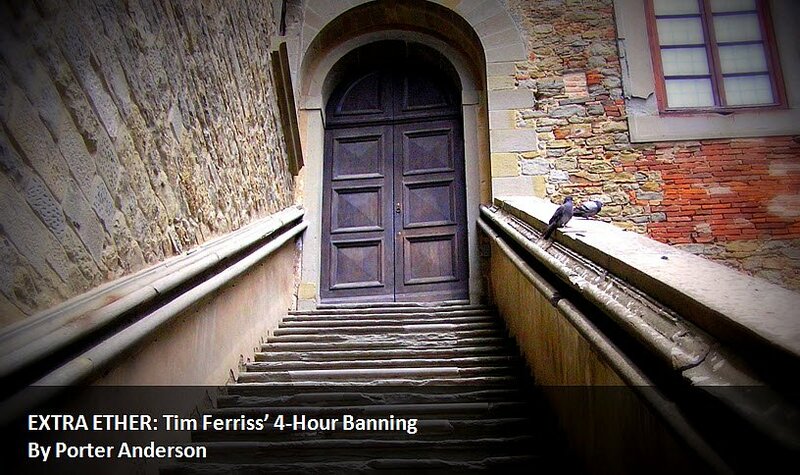 Indeed, what is being “banned” here is not Ferriss, not “Timothy,” as he’s known on his book covers, nor his writings or sometimes controversial lifestyle recommendations, nor his eagerly photographed 4-Hour Body, nor his assertion that one can be successful with a mere 4-Hour Workweek. That’s the problem. There is no Girolamo Savonarola in the room. The Friar of 15th-century Florence might have burned Ferriss at a 4-Hour Stake at the first baring of those pecs and external obliques. But this “banning” is not ideological. And Owen is questioning the use of the term by the wunderkind bestseller. This is the ad image BitTorrent is using to promote its “4-Hour Project” bundling deal with Tim Ferriss on Tuesday, launch day for The 4-Hour Chef. If anybody can rally BitTorrent’s 160-million-strong “people-powered network,” it’s the articulate Ferriss. At 35, he’s a guy’s guy whose eloquence doesn’t always jibe with his game-the-system shtick. If this book fails due to a retail stonewall, I can tell you for a fact that more than a dozen A-list authors I know will hit pause on plans for publishing innovation for the next few years. Is The 4-Hour Chef the same as Huckleberry Finn? Of course not, and I never implied that it was. But do I view stifling innovation and free speech (through distribution or otherwise) as a malevolent thing? Yes. Regardless of the motive (moral, economic, etc. ), the outcome is the same: regress instead of progress. And regress snowballs quickly. At the end of the day, I want people to think about boycotting and banning, both historically and moving forward. The fact that you (Owen) wrote a piece about precisely that — raising awareness and stimulating conversation — is a great thing.That public discourse is one of my goals. Told you he’s good. I like this debate and I like Ferriss’ ready wit as much as I like Owen’s robust concern. It’s good, really, to find a self-marketer of his magnitude waiting when someone as adroit as Owen comes looking for him. She’s way too smart to leave home without her own rationale. Click here to read the entire post. And Join us Thursdays at JaneFriedman.com for Writing on the Ether, and on Tuesdays at PublishingPerspectives.com for Ether for Authors.